The largest and most ambitious construction project to date in Omaha’s thriving Blackstone Neighborhood is underway. The (6) story, 140,000 SF Blackstone Corner Building will feature underground parking, main level restaurants and retail and 112 apartment units comprised of studio, one and two bedroom units on the top four floors. 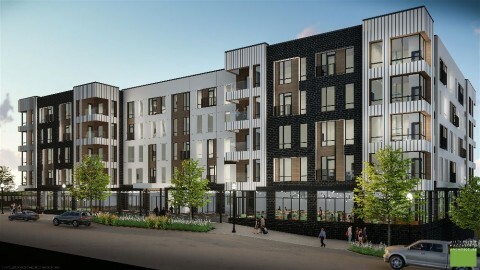 The exterior façade will mix brick, composite siding, EIFS, metal panels, aluminum storefronts, fiberglass windows, steel canopies and balconies to create one of the truly unique modern buildings of Omaha. The project is being developed by Greenslate Development and Clarity Development. Construction is scheduled for completion in summer of 2019. Ronco Construction is the general contractor with Alley Poyner Macchietto Architects leading the design team.